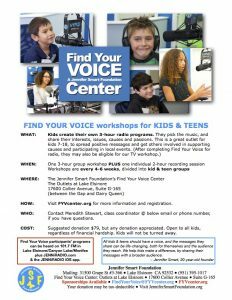 Our next Find Your Voice workshop will be on Saturday, August 26th. This one is for kids ages 10-15. Click here to indicate your interest in joining this or a future Find Your Voice workshop. These workshops help sick, healthy & disadvantaged kids improve communication skills and increase self esteem. With our coaching, kids and teens create radio and TV programs, which we air on our media properties. This program is open to ALL kids, ages 7-18, and our goal is never to have to charge for these workshops. We rely on our supporters to sponsor kids who participate in the Find Your Voice program.